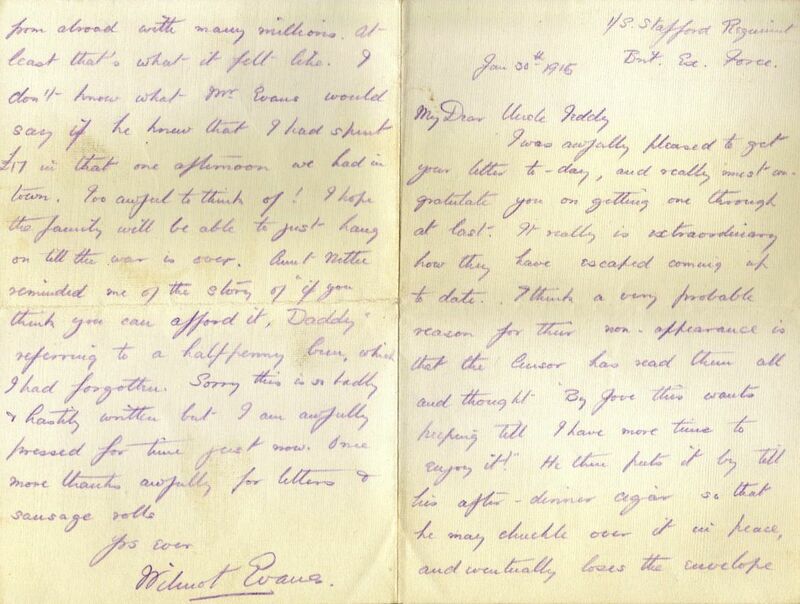 This letter, from Wilmot Evans to his uncle Edward Dimmack Marten, is written on 30 Jan 1915 from the trenches. Wilmot had returned after a spell of leave back in Hagley, probably in early January, after his ordeal at the first Battle of Ypres in October 1914. He was to stay in France until he was wounded again on 16 May 1915. I was awfully pleased to get your letter today and really must congratulate you on getting one through at last. It really is most extraordinary how they have escaped coming up to date. I think a very probable reason for their non-appearance is that the censor has read them all and thought ‘By Jove this wants keeping till I have more time to enjoy it!’ He then puts it by till his after dinner cigar so that he may chuckle over it in peace, and eventually loses the envelope or something like that and has to send it back to you. I cannot conceive any other reason at any rate as I have had most of my other letters very regularly indeed. I do hate being back here again in all the cold and misery but after all I would rather be here than permanently at home, I think though I am not doing much good to anybody in either place. I loved seeing Aunt Nettie again. She was in great form and amused us all day long with her stories. I will try and pay you a visit at Cheltenham, if ever I get leave again, which I am not expecting for some time at anyrate. 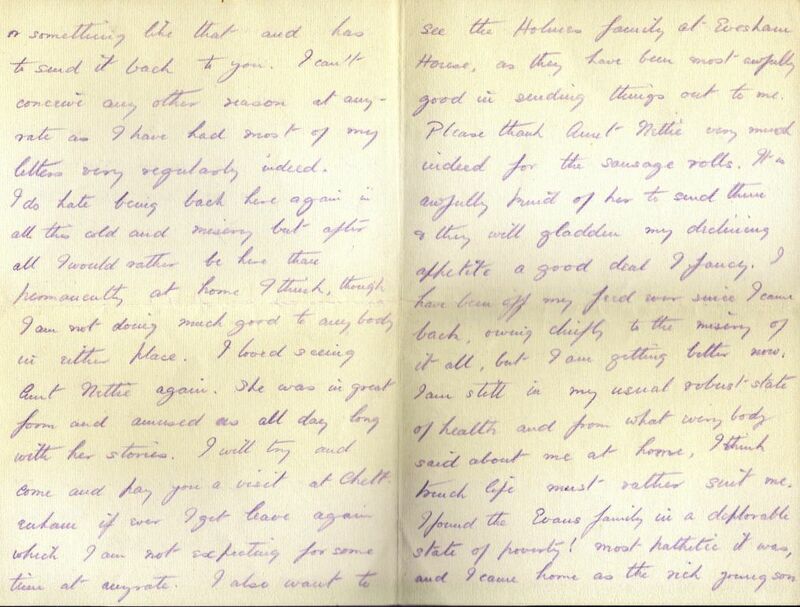 I also want to see the Holmes family at Evesham House, as they have been most awfully good at sending things out to me. Please thank Aunt Nettie very much indeed for the sausage rolls. It is awfully kind of her to send them & they will gladden my declining appetite a good deal I fancy. I have been off my food ever since I came back, owing chiefly to the misery of it all, but I am getting better now. I am still in my usual robust state of health and from what everybody said about me at home, I think trench life must rather suit me. I found the Evans family in a deplorable state of poverty! Most pathetic it was and I came home as the rich young son from abroad with many millions. At least that’s what it felt like. I don’t know what Mr Evans would say if he knew that I had spent £17 in that one afternoon we had in town. Too awful to think of! I hope the family will just be able to hang on until the war is over. Aunt Nettie reminded me of the story of “if you think you can afford it, Daddy” referring to a halfpenny bun, which I had forgotten. Sorry this is so badly and hastily written but I am awfully pressed for time just now. Once more thanks awfully for letters and sausage rolls.